Rectangular lights of video projections travel across the surface of the walls inside an empty warehouse, while Gustav Holst’s The Planets Suite Op. 32 is playing through speakers into the space. 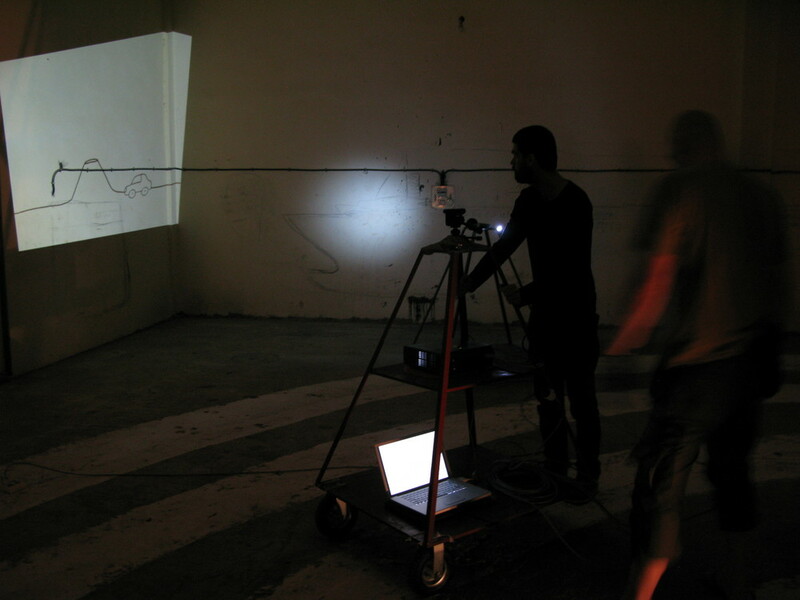 The resulting video, based on the performance, shows the projections as captured by a camera attached to custom-made dollies. Sometimes the constant motion is barely perceptible, at other times the projected light reveals parts of the warehouse, like corners, bricks, or abandoned equipment. At one point the projected light also reveals the artist sitting on a chair playing a thumb harp. Projected text tells a series of anecdotes, stories about people who get lost or fall asleep and are unable to wake up. Drawings of cars illustrate the stories.